Indeed, the reaction to Trump’s decision was so overwhelmingly negative that Washington pundits speculated that it was only a matter of time before Trump “walked back” the decision by slowing the withdrawal—a deferential nod, it was said, to wiser and more seasoned foreign policy veterans. In fact, that not only hasn’t happened, the president has dug in his heels, issuing eyeball-to-eyeball orders to military commanders that are anything but ambiguous. After an extended question and answer session with the press on December 26, Trump was privately briefed on the anti-ISIS effort by LaCamera, who told the president that only a few pockets of ISIS militants remained in Syria’s Euphrates Valley. Trump praised the effort, I was told, but then issued his order. “I want us out of Syria,” the Centcom officer with whom I spoke quoted Trump as saying. “There wasn’t anything ambiguous about it,” the Centcom senior officer added. Trump’s decision provides a window into what actually constitutes a direct order from a president and how it is implemented—while also separating fact from noise. On December 30, four days after his visit to Iraq, Senator Lindsay Graham told reporters that he would try to persuade Trump to rethink his decision, to “sit down with his generals and reconsider how to do this.” His goal, Graham said, was to “slow this down. Make sure we get it right.” Graham’s effort came the next day, during a lunch meeting with Trump and General Joseph Dunford, the chairman of the Joint Chiefs of Staff, at the White House. Graham emerged from the meetingreassured, hinting that his efforts had been successful. “After discussions with the president and Dunford, I never felt better about where we are headed,” he said triumphantly. Triumphant or not, Graham had not, in fact, persuaded Trump of anything, outside of an agreement that the Syria withdrawal would not be immediate but could take at least 90 days to implement. But that was already in the cards—as it takes at least 90 days to withdraw 2,200 troops from anywhere. “You don’t just back up a truck and throw in some boxes,” retired Colonel Kevin Benson says. Benson would know. A West Point graduate and former director of the Army’s School of Advanced Military Studies, Benson developed the plan for the ground invasion of Iraq in 2003, before eyeballing the final U.S. troop withdrawal in 2011. That pullout, which involved extracting the final 50,000 U.S. troops from Iraq, took one year to carry out. Benson adds that it will not only take 90 days to withdraw from Syria, it is likely the withdrawal will include a temporary increase in the number of troops deployed in the country. Which is only to say that, while Trump’s Syria withdrawal decision has been derided by a cross-section of the foreign policy establishment, the announcement was greeted with a collective shrug by most senior military officers. A planner at Centcom headquarters in Tampa was puzzled by the controversy over the Trump announcement, saying that the only response he received was from officers “whose immediate reaction was not whether this was a good or bad decision” but how quickly and effectively it could be implemented. 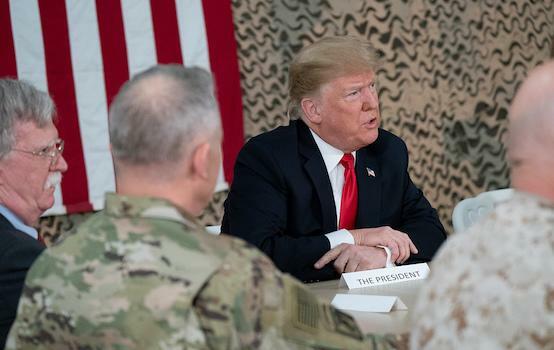 While military officers are loathe to express an opinion on any president’s decision, Trump’s plan tends to break down along traditional (and predictable) service lines, with the deepest disagreements between senior Army officers and their Air Force counterparts. “Getting out is not a good option,” a recently retired Army officer who advises his former service (and reflects their views) told me.